Franchised fast food is not normally my cup of tea, but I’ve made exceptions before- like our family outing at Lafleur’s in Montreal. On the way home from my visit to Boston University with Veggyhead, we were feeling the need for food before braving the rush hour traffic on the Mass Pike. There aren’t too many places that can please a full on carnivore like myself and a vegetarian like Veggyhead, much less a fast food joint. 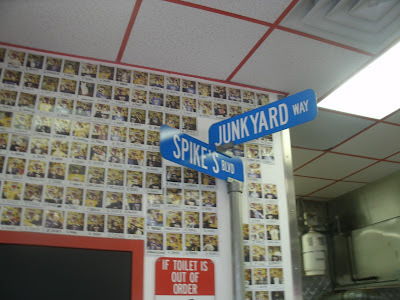 We weren’t too far from the Allston, Massachusetts location of this region’s most recently successful Hot Dog Franchise, Spike’s Junkyard Dogs, so we decided to give it a go. Veggyhead had a hankering for a veggydog and was yearning for some of the internet stardom experienced by her sister, Little Miss. I knew we wouldn’t find the owner here, so I didn’t poke around and bother the help too much; No hablaron de todos modos Inglés. 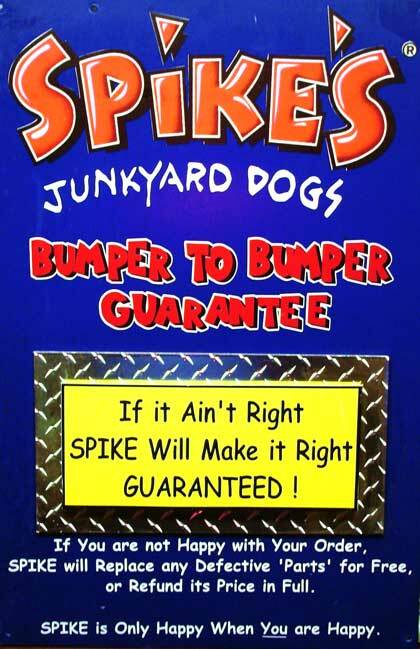 “David Drake had a bulldog named Spike. 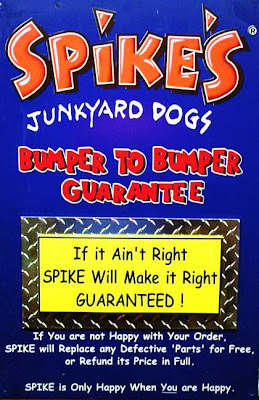 One day, someone saw the dog and said, ‘Look at him, he’s a real junkyard dog.’ That comment helped unleash a highly successful fast-food business called Spike’s Junkyard Dogs — an inventive restaurant chain serving unique hot dogs in a unique environment." Rather than re-tell a tale that’s been told about the making of a hot dog franchise empire, I’ll leave it to you readers to find out for yourselves on Spike’s website. I’ll say one thing about this place, it’s got character! 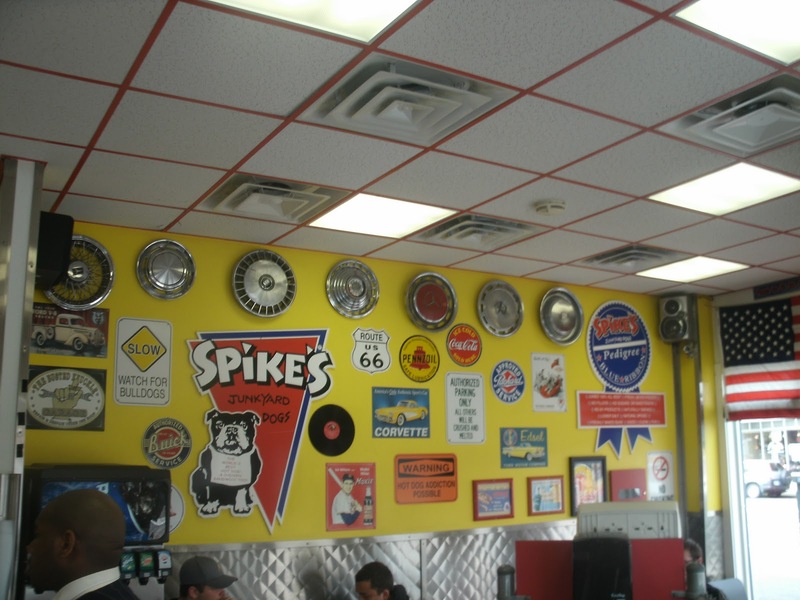 The interior is covered with “junkyard-like” decor. 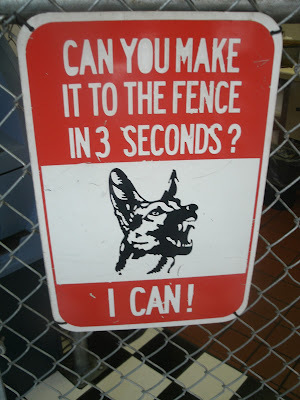 Some of the signs inside are on the humorous side. 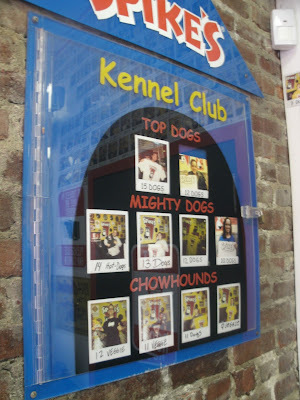 A unique feature at each Spike’s location is “The Kennel Club.” If you can eat 6 or more hot dogs in 30 minutes (without using the rest room), you get a free Spikes Tee Shirt and your picture on the “Wall of Fame.” Eat more than the reigning champ (16 at this location) and you get a tee shirt, hat and your meal is free; you also get featured in the “Top Dogs” area. Blow chunks: DISQUALIFIED! I wonder if Tyler from BOSE could pull this off….. 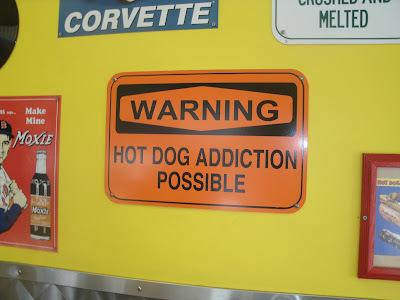 This place certainly has more personality than your standard Mickey D’s, but even this sign couldn’t convince me. 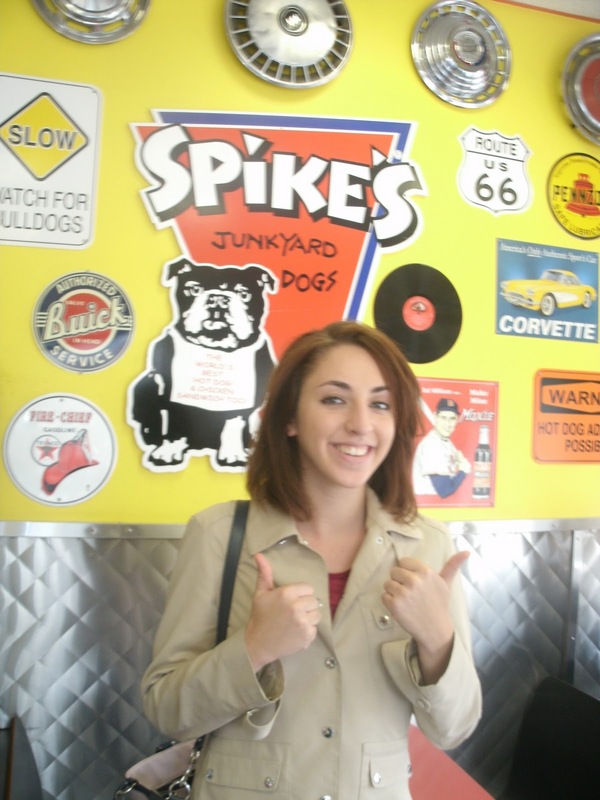 The proof is in the pudding, or, in this case, the hot dog. The guarantee made me feel a bit more confident. In addition to Hot Dogs, there are chicken sandwiches, subs, burgers, wings and pizza. 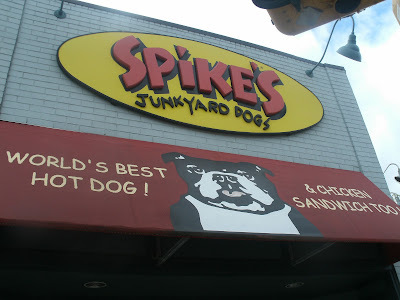 Spike’s serves up their own house brand hot dog on a fresh baked sub style roll. The sign says it all. There are too many condiments and toppings to list! It didn’t take long for our dogs to be ready. Veggyhead got a Veggy Dog with brown mustard. 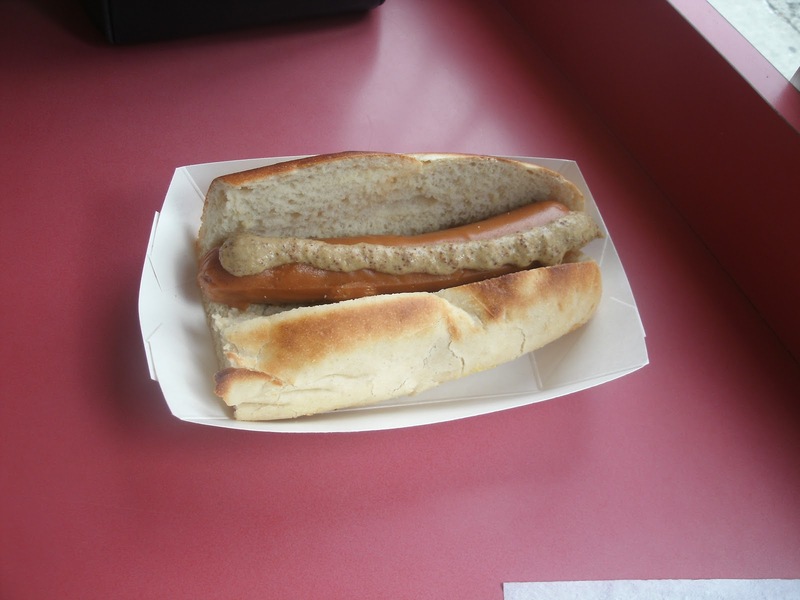 This is basically soy protein and spices rolled into the shape of a hot dog. Hey, it takes all kinds. 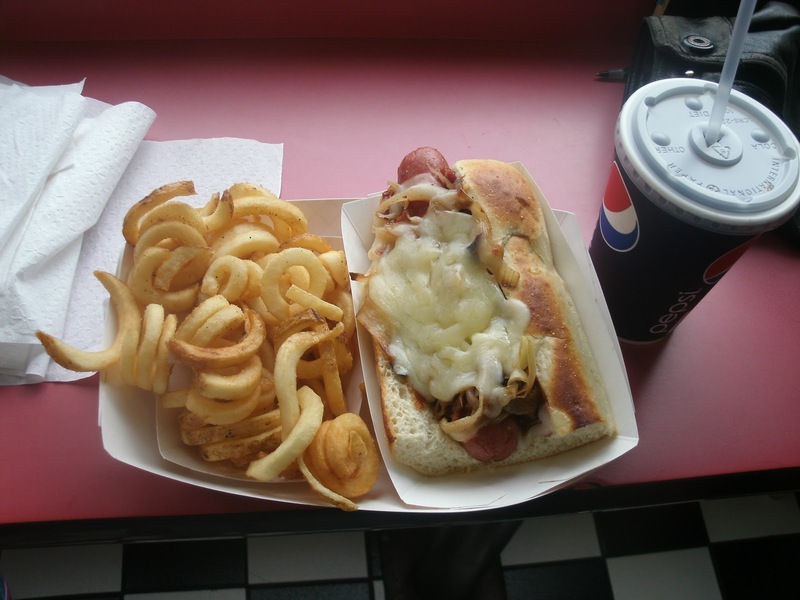 I went for a “meal deal” which is a hot dog, curly fries and a drink. 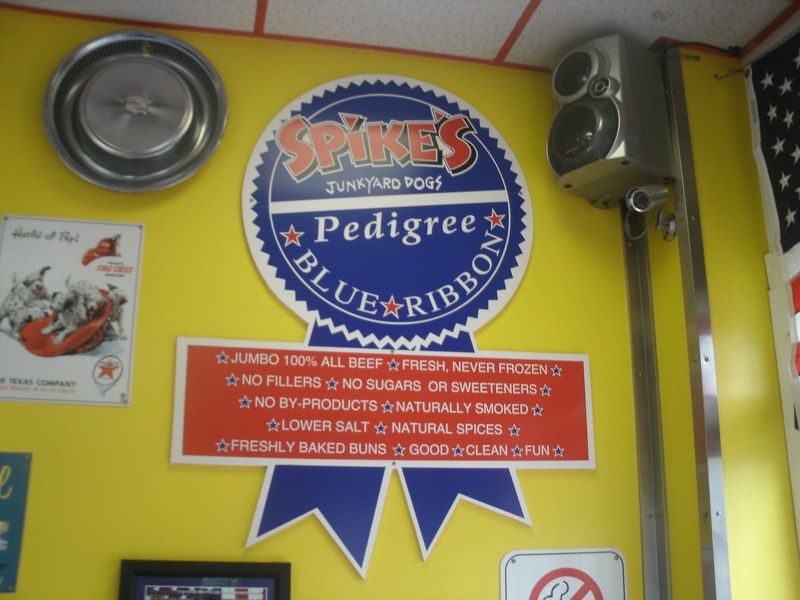 I, of course, got a Diet Pepsi. The dog I ordered was called a Casey Dog. It has barbecue sauce, sauteed onions, BACON, and melted cheddar cheese. Will you look at that dog! Wow. 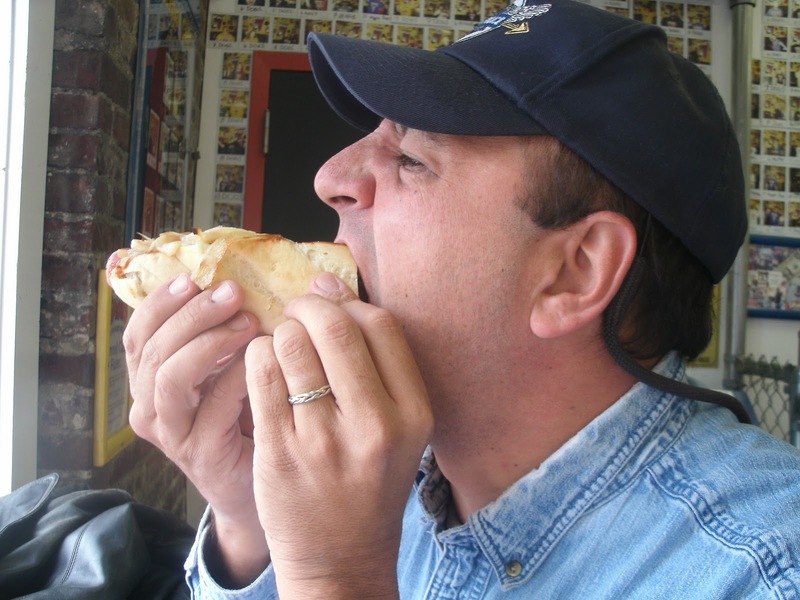 Time to CHOW DOWN (drum roll for Veggyhead‘s Hot Dog Stories debut). DOH! 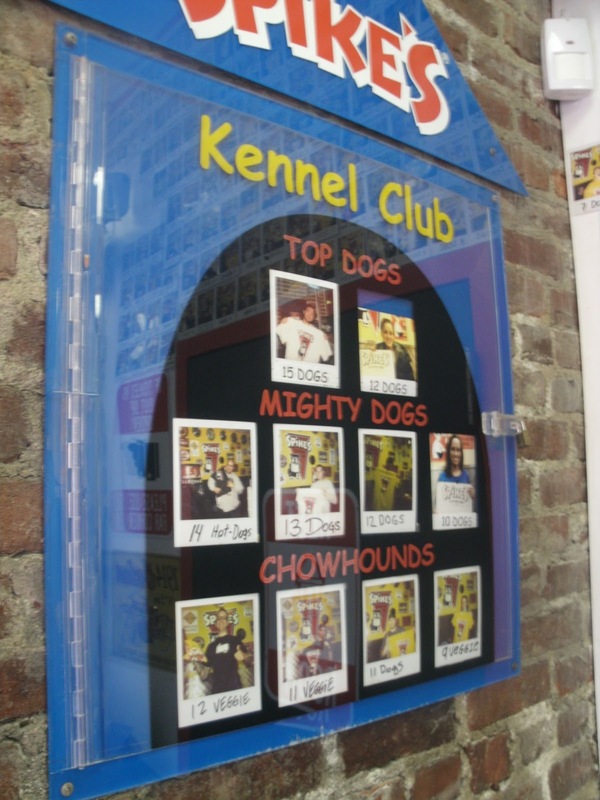 Just like Mrs. Hotdogman! At least I’M not shy about CHOWING DOWN! Well, well, well. 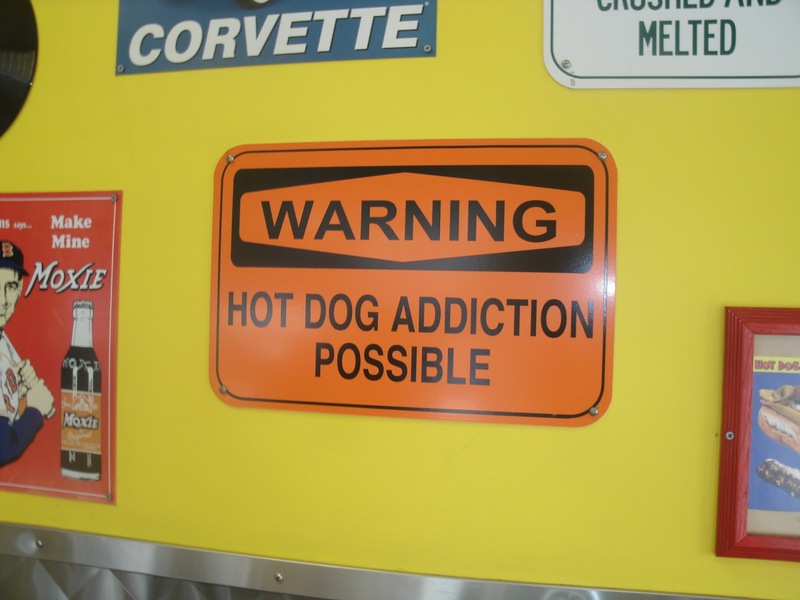 The Hotdogman is going to have to rethink his position on franchised fast food. This was one fine hot dog. The dog was reminiscent of an all beef Pearl frank. The melted cheddar cheese had a smoky flavor that contrasted nicely with the sauteed onions. The barbecue sauce completed the flavor trifecta while the bacon brought the whole concoction to new heights of awesomeness. 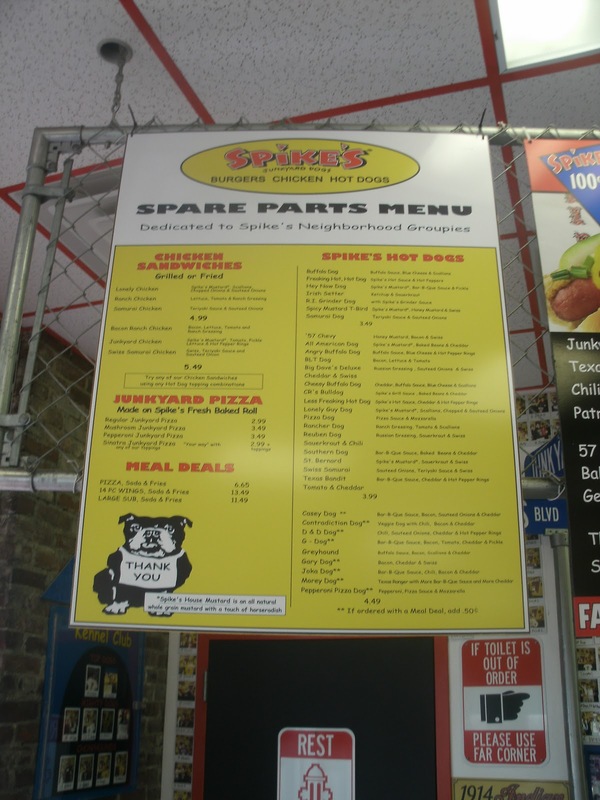 If I didn’t go to new hot dog places 2-3 times a week, I’d endeavor to eat my way through the 3 dozen or so specialty dogs Spike’s offers. 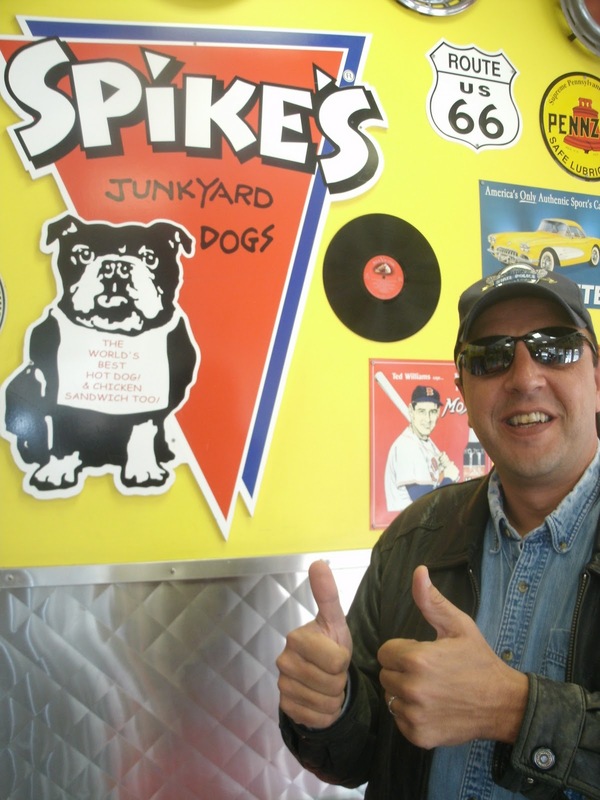 This was not only much better than I expected, it was something I’d want to have again- and that’s high praise from the Hotdogman! Veggyhead liked her veggy dog and she gives Spike’s TWO THUMBS UP! TWO BIG THUMBS UP FROM THE HOTDOGMAN! !